Grain Free Twix Bars. Twix bars were one of my favorite candy bars back in the day. I already have one twix recipe on my blog, but I wanted to create another one that was grain free with much less ingredients. 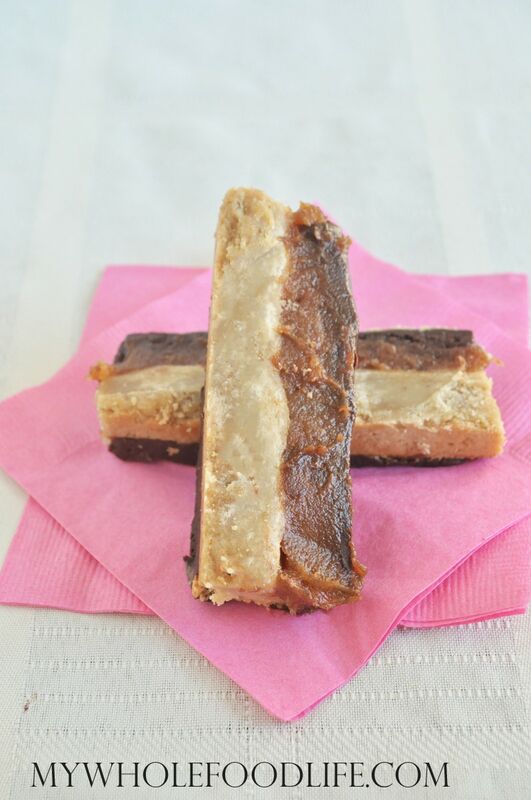 That is how I came up with these grain free vegan twix bars. It was really hard to get a good pic, but I promise you they are delicious! Super easy too. Only 5 ingredients! This recipe has hardly any added sugar at all. There is some in the chocolate chips and only a little in the crust layer. Here is a quick video on how to make your own cashew butter. Looking for more candy recipes? Homemade Twix bars without the guilt! In a food processor , combine the cashew butter and maple syrup. Line a loaf pan with parchment paper. I used a 5x9 inch loaf pan . Press the cashew mixture into the bottom of the pan and press down well. In a blender or small food processor, blend up the dates into a caramel. Once the cookie mixture is cool, spread the date caramel on top. Place in the fridge while you make the chocolate. Using a double boiler method, melt the chocolate chips and coconut oil. Mix well into all the chips are smooth. Life the cookie out of the loaf pan and onto a plate. Pour the mixture over the cookie and place in the fridge/freezer to firm up. Once everything is firm, use a sharp knife to slice into bars. You can store in the fridge or freezer. I like to store mine in the freezer. Enjoy! Can't wait to try this! Love recipes using dates and no oils. How many cups of cashews will yield 1 1/4 cups of cashew butter? I usually use the same measurement of nuts & have had good results in other recipes. Can I use sunflower butter instead? Nut allergy... Thank you!! Which Sunbutter do you use that is safe for those with nut allergies? Trying to find one not manufactured with nuts! Thanks! I used to love Twix bars, but then I realised that they were way too sweet... These should be perfect! YUMMMMM!!! Brilliant! Can't wait to make this. And, thanks for the video on making cashew butter. Removed all the worries. Thanks Linda! I hope you enjoy it. Does the water used for soaking dates go in food processor? I just made these and wow they are truly delicious! I ended up doubling the middle date layer as I wanted it a bit thicker. I wish I could post a picture because they are perfect! I had the hardest time with the cashew butter/maple syrup "cookie" layer. :( It never firmed up like a cookies and was gooey. So, I scraped it out of pan, put back in mixer and added an egg, re-baked it, and it was better but still a bit crumbly. How do you get those 2 ingreds to form a "cookie" layer? Or is yours also still gooey? Mine was not gooey at all. Maybe it needed to be cooked a little longer? Everyone's oven is a little different. Sorry you had an issue with it.